It was fitting that Clarence Hiles helped preside over the 25th anniversary of the Northern Cricket Union’s prestigious league awards on Monday night. Hiles is now the Union’s president but back in 1993 he pioneered the awards as boss of the Britannia Building Society in Belfast. The latest group of Northern Cricket Union league awards' winners as the tradition celebrates its 25th anniversary. He said: “I’m obviously delighted the awards have endured so long. “It’s a real indication of how the players value them,” he added. David Robinson said his company was proud to carry on “such a very fine tradition.” And to prove it, for the first time each trophy is being inscribed with the player’s name, his club and details of his performance. The season’s first presentations saw 18 players win awards in the first seven weeks and were evenly split between batsmen and bowlers. John Busby returned the best bowling figures of 6 for 11 and there were hat tricks by JJ Strydom of Woodvale. and Phil Kernaghan of Templepatrick. Down the years highlights included Niranjan Godbole whose 24 awards in 12 years with Lurgan top the table. Apar from a hat trick all were for centuries. Billy “Bumper” Dale whose 7 for 14 for Cooke Collegians in 2014 made him the oldest award winner at the age of 66. Neil Gelston of Drumaness bagged three awards in as many weeks in 2015: first he scored 132 out of his side’s total of 179 and in the same month took 7 for 6 including a hat-trick. Seventeen year old Taz Kwela whose remarkable figures of five wickets for no runsfor Bangor in 2014 saw the NCU relax the threshold of six wickets. As a schoolboy he was allowed to bowl only seven overs which he did successively. Brian Millar and Bertie Stiles each received awards as wicket keepers. 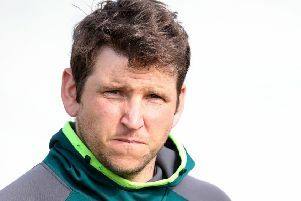 Millar claimed four victims in a row for Bangor while Stiles took a total of seven in an innings for Queen’s University.